Yesterday was almost the complete boring day. Liz's brother came for his birthday but wanted to spend it at our house. So, after I went with her to martial arts, we then came home for a brief cleaning of the house and waited for him to show up. Once he did get here, he sat down on the couch for a seven hour stay. To make matters worse, he is not a conversationalist at all. At least we were home and didn't tie up a servers' table for a couple hours. Plus, I could get up and move around a bit when I felt like the chair was becoming part of my body. So much for an exciting blog post! 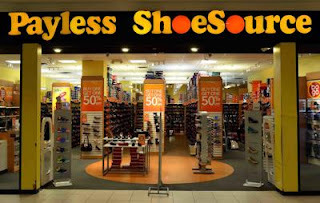 Changing gears now, perhaps those of you in the United States have heard, Payless Shoes is closing all of it's 2000 plus stores. Over the years, on occasion, I have been able to find good shoes in my size (11Wide) at Payless. I am sad to see them go. We are heading there today to see what is available. Payless stores should be open through March. I'm sure they will keep restocking their shelves for a few more weeks. I think that you can also order online for a store pickup, too.